"Not forged!" and snatching Perth's levelled iron from the crotch, Ahab held it out, exclaiming- "Look ye, Nantucketer; here in this hand I hold his death! 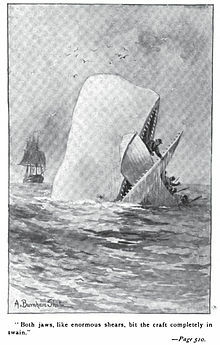 Tempered in blood, and tempered by lightning are these barbs; and I swear to temper them triply in that hot place behind the fin, where the White Whale most feels his accursed life!" "Then God keep thee, old man- see'st thou that"- pointing to the hammock- "I bury but one of five stout men, who were alive only yesterday; but were dead ere night. Only that one I bury; the rest were buried before they died; you sail upon their tomb." Then turning to his crew- "Are ye ready there? place the plank then on the rail, and lift the body; so, then- Oh! God"- advancing towards the hammock with uplifted hands- "may the resurrection and the life-"